You can use the first coloring sheet several different ways. 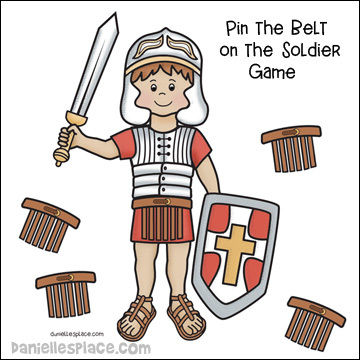 Use the soldier picture with the complete armor and have the children color the entire picture with all the armor, use the soldier picture with separate armor pieces and have the children color and glue on a different piece of armor each lesson, or use the soldier picture with just the belt missing for the Belt of Truth lesson and have your children glue on just the belt. Game #1 - Break your class into teams and play with just twelve cards - two of each pattern. Have your children take turns turning over two cards to see if they match. If they match, the child gets to keep the cards. If they don't, he has to turn them back over and the next child takes a turn. At the end of the game the child who gets the most matches wins. Game #2 - Print out enough cards so that you have at least a set of cards for each child. Have all the children sit in a circle and place all the cards face down. Play like Game #1, except the first child to get all six sets of cards wins. Game #3 - Play like above, except the children turns over one card at a time. If he doesn't already have the card he turns over, he gets to keep it. If the child picks up a card that he already has, he has to turn it back over and try again on his next turn. The child who finds all six cards first wins. 1. Cut out a visor from silver poster board as shown in the picture. A pattern for the visor is available to members of Danielle's Place and The Resource Room. Cut out the slats in the middle. Use the pattern to trace the shape onto silver poster board. The silver poster board is actually silver and gold. One side is silver and one is gold. Poke a hole at each end of the visor. 2. To make the hat part of the helmet place two or three pieces of newspaper on top of each other and fold them in half on the natural fold with the fold on your left. Fold the top half down over the bottom half. The new fold should be at the top. Fold the top two corners in so that they meet in the middle. See diagram # 1. 3. Fold up the bottom edge so that it meets the bottom edge of the triangles you just made. But only fold up 4 layers of newspaper. The other layers will be folded up on the back. See diagram # 2. 4. Fold up the bottom edge of the newspaper again so that it is folded at the bottom edge of the triangles. See diagram # 3. 5. Turn the hat over and do the same thing to the other side. 6. Fold the points that stick out back and over each other. Punch a hole in the folded-over triangles. This is where you will attach the visor. Tape it down. 7. Put your hand up inside the triangle and spread it out. 8. Paint the hat silver or a metal color. 9. Attach the visor to the hat with brads so that it can be lifted up and down. Copyright 2005, Digital by Design, Inc - See Copyright Information. 1. Cut a 5" hole in the middle bottom of a grocery bag. Cut a line from the hole up the middle of one of the longer sides of the grocery bag to the top of the bag. Cut 5" armholes at the bottom side of each bag. 2. Cut 3" x 4" rectangles from the silver poster board. Round off one of the 3" sides. This will be the bottom of the pieces. 3. Tape the pieces onto the front and back of the grocery bag starting at the bottom. Tape or glue a row all the way across overlapping as you go. Tape another row on top of that one over lapping the bottom row. Keep adding rows until the back and front are covered. You may want to paint the top and side to match the front and back. 2. 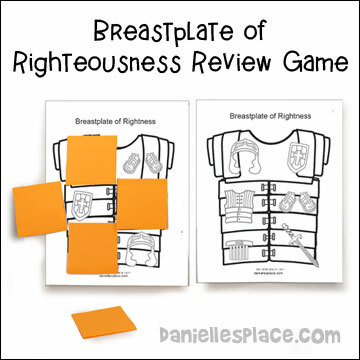 Cover the breastplate game board with sticky notes. You may have to double the papers so that the image doesn't show through. 3. 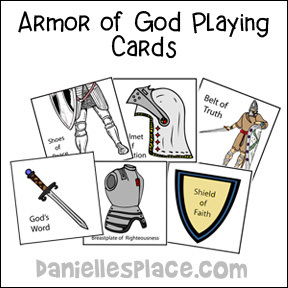 In class take turns asking your students questions starting with, "Would you be wearing the Breastplate of righteousness if . . ."
1. 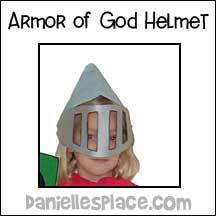 Print out the Helmet of God coloring sheet and visor pattern sheet. 2. Use the visor pattern to cut visors shapes from poster board. 3. Cut out the slits so that the soldier's eyes can be seen through them. 4. Have your children color the pictures. When they are finished coloring, staple the visor onto the helmet at the sides. The visor will arch up over the picture a little. 1. Draw a belt onto card stock and cut it out. A Belt Pattern as shown in the picture is available to members. Glue the pieces together. You may have to cut off some squares depending on how big you want the belt. If you want to make the belt fit over the breastplate you will have to make it extra big. You may have to print out the pattern more than once and piece it together. 2. Cut one of the slits open at the end of the belt depending on how big you need the belt. 3. Color the belt with metallic crayons (Crayola). 4. To make the apron, cut brown construction paper into 2" stripes. Glue sequins down the lengths of the strips. Glue the strips to the front of the belt. 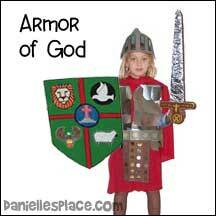 Children try to match up the "Truth" Bible verses to the lies that are written on the belt. Some of the Bible verses may work with more than one lie, so they may have to switch some around so all the Bible verses match one of the lies. Children glue the Bible verse strips in order on the "Belt of Truth" to review the Bible Verse. 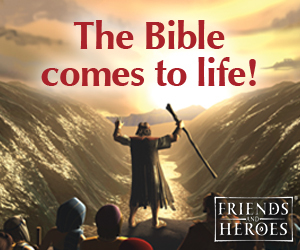 Available in KJV and NIV. Copyright 2015, Digital by Design, Inc - See Copyright Information. Play "Pin the Belt on the Roman Soldier"
2. Cut off the edges and glue them onto a piece of foam core board. 3. Print out the belt pattern onto card stock and cut out them out. 4. Tape the Roman Soldier up on the wall at the children's height. 5. In class give each child a belt with a piece of tape. Have the children line up behind the picture. Ask the first child if he would be wearing the "Belt of Truth" if he believed one of the following statements and then tell them to state the truth. Once he states the truth, tie a blindfold on the child and spin him around. The child who gets his belt closest to the belt on the soldier wins. 1. It's okay to do something wrong if everyone else is doing it. 2.If no one sees you doing something you're not supposed to be doing, it's okay to do it. 3.If you don't get caught doing something you're not supposed to be doing, it's okay to do it. 4.It's okay to take something that isn't yours if no one will miss it. 5.It's okay to hit someone if they hit you first. 6.It's okay to treat someone mean, if they treat you mean. 7.It won't hurt to take just one little piece of candy before dinner, even if your mom tells you not to because it really won't affect your appetite. 8.Your Dad just lost his job and you are worried you won't have enough food to eat. 9.You are afraid to stick up for the boy who always gets picked on because you don't want to get picked on too. 1. Cut out the blade shape from the foam core board. I made mine 20" long. It is 3 inches across at the bottom and 1" at the top. Round off the top point. 2. Cut out a handle from foam core board using an Exacto knife and use it to cut two more handle shapes from the foam core board. Glue one handle shape to one side the blade at the bottom. Glue the other to the other side. Cut the third shape apart so that you can slide the pieces in between the other two handle pieces glued to the sword. Place glue on each side of the pieces and insert them between the two pieces you glued onto the blade. Use sand paper if you would like to make the edges smooth. 3. Paint the handle brown like wood and add some decorations. 4. Wrap a piece of aluminum foil around the blade and tape it on. 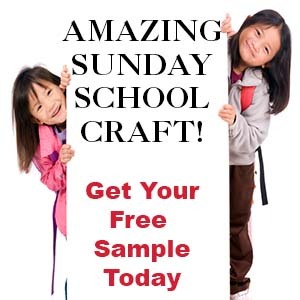 The pattern for this craft is available on The Resource Room. Copyright 2010, Digital by Design, Inc - See Copyright Information. 1. Cut two sword shapes from craft foam about 8 inches long and no wider than the tape at its widest end. 2. To make the sword handle glue two mini jumbo craft sticks perpendicular to the jumbo craft stick about 3 inches from one end of the stick so that the mini craft sticks. The mini craft sticks should be on each side of the jumbo craft stick. 3. Glue the short end of the handle onto one side of the craft foam sword and then glue the other craft foam sword on top to cover the top of the handle. 4. 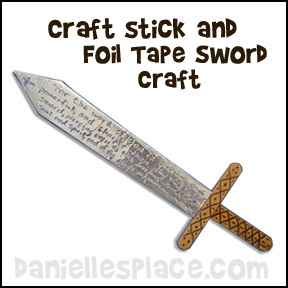 Cut pieces of foil tape the length of the sword and stick them over the craft foam sword on both sides. 5. 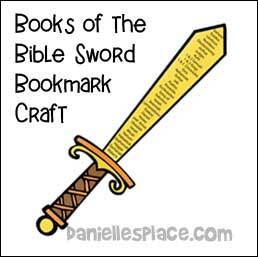 In class have your children write the Bible verse on the sword with a ball point pen, and then color the handle of the sword with markers. Copyright 2013, Digital by Design, Inc - See Copyright Information. 1. Print out the sword patterns onto colorful card stock and cut them apart. 2. 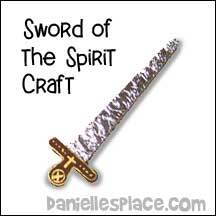 In class have the children cut them out and write what the Bible verse means to them on the back of the swords. 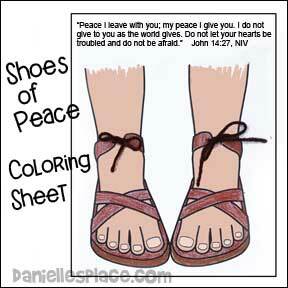 These would make a great craft for vacation Bible school. They cost less than twenty cents each to make. 1. 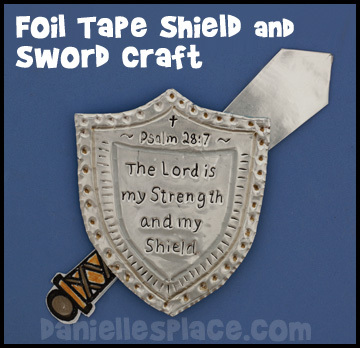 Make a shield template no wider than four inches wide and five inches long with the Bible verse written in the middle. Cut out the patterns. 2. Cut the foil tape into five-inch pieces and the craft foam into 4" x 5" rectangles. Peel off the backing from the tape being careful not to crease the tape. Stick the tape on the foam sheets smoothing them down so there are no bumps. 3. Place the template on the cut foil tape and trace around it using a ballpoint pen. Cut out the shield shape. 4. Engrave the foil shapes with a pen tracing over the letters on the pattern. Remove the pattern and add more engraving using other utensils. 5. To make a sword print out a sword pattern onto card stock. Make the sword wide enough to fit a craft stick in the center. Place a sword shape pattern on top of another sheet of card stock and cut it out so that you have two sword shapes. Glue a craft stick in between the two sword shapes. Use the sword blade shape to cut the shape from the foil tape so that it overlaps about 1/2 inch on all sides. Remove the backing of the tape and stick it to the sword. Cut another blade shape from the tape and stick to the back of the sword. 1. Make a shield template by drawing a 3.75" circle onto card stock (heavy paper). Cut out the template. 2. Cut the foil tape into four-inch pieces and the craft foam into 4" x 4" squares. Peel off the backing from the tape being careful not to crease the tape. Stick the tape onto the foam sheets smoothing them down so there are no bumps. 4. Engrave the shield and other objects by pressing down into the foam. 5. Glue silver buttons and other objects to the shield. 6. Print out flame shapes onto red paper and cut them out. 7. Curl the flame patterns around the ends of toothpicks and glue them using tacky glue. 8. 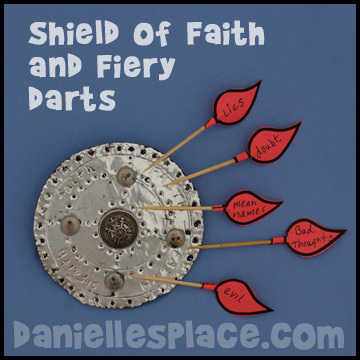 In class have your children think about Satan's fiery darts. Have them write things on the flames the shield of faith can protect them from such as: insults, lies, envy, greed, bad names, etc. They can then stick the "fiery darts" into their shields. 1. Cut a shield shape from half a sheet of foam core board or cardboard. 2. Paint the shield with child-safe paint. 3. Add a coat of arms if you would like. 4. Cut a strip of cardboard and glue to the back for a handle. 2. Punch holes in the straps of the shoes around the ankles. 3. In class have the children color the shoes and then thread yarn through the holes and tie them in a bow. 1. Flatten out the linoleum on the floor so that the bottom side of the linoleum is facing up. Trace the children's feet and cut them out. Linoleum is fairly easy to cut so you shouldn't need special scissors. 2. Mark six holes about 1/2" to 3/4" depending on the size of the shoe along each side of the sole starting at about where the base of the toe would be. Punch holes in the linoleum sole with a hole punch. I used a leather punch. 3. Cut strips of material so that the stretch of the material is along the length of the material. Spandex stretches both ways so you won't have to worry about which way to cut it. I cut 1" strips across the whole width of the material. I think it was 45" wide and used the whole length. Cut both ends to a point as shown in the picture. 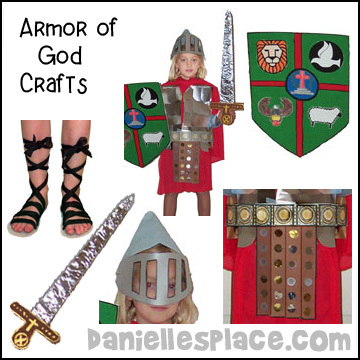 This craft comes from the "Armor of God - Shoes" Bible Lesson on The Resource Room where you will find even more crafts, games and learning activities for Sunday School. The tunic and cape were made from a piece of stretchy red material that cost $1.00 a yard at Wal-mart. I used one yard for the tunic and one for the cape. To make the cape I just cut a square piece of material and tied two corners together around the neck. To make the tunic I just folded a rectangle piece in half and cut a neck hole in the middle of the folded end. Put it over the child's head and use a length of material to tie it around the child's waist. March to a Military Chant - Start by counting one, two, three, four, one, two, three, four, etc. until all the children are marching at the same pace. Act like a drill sergeant. Tell them to stand tall, face forward, lift their feet up high, and look proud to be in the Lord's army. Then tell them to repeat after you the following lines. Once they get the rhythm and words, you can have them march in a circle. Do not copy this song and place it on another web site, blog, pdf. file etc. 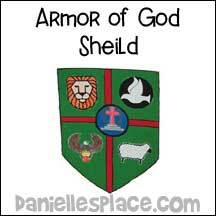 This chant comes from The Resource Room from the Armor of God Lessons. Gold Roman Helmet - This is an adult-sized helmet and comes in both silver and gold. It is made of flexible, light-weight plastic, and looks authentic! Silver Roman Helmet - This is an adult-sized helmet and comes in both silver and gold. It is made of flexible, light-weight plastic, and looks authentic! 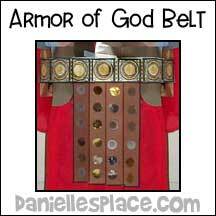 Roman Soldier's Belt Costume - This belt is adult-sized and 17-inches long. Gladiator Costume - This costume comes in three different child sizes. Gold Roman Shield - This light-weight shield has an authentic antique look and is 18 inches in diameter.